Austhorpe Primary School are proud to be accredited as a Dyslexia Friendly School! At Austhorpe Primary School we have achieved our aim of becoming a 'Dyslexia Friendly School'. As a Dyslexia Friendly School, we promote good practice for teaching and learning which benefits all children, not just those who may have a learning difference. 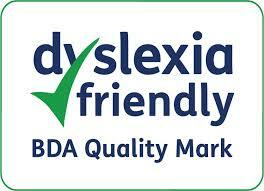 In addition to this we are working towards achieving the British Dyslexia Association Quality Mark. "If a child does not learn in the way we teach then we must teach him/her in the way in which he/she learns". - Characteristic features of dyslexia are difficulties in phonological awareness, verbal memory and verbal processing speed. - Dyslexia occurs across the range of intellectual abilities. - It is best thought of as a continuum, not a distinct category, and there are no clear cut-off points. - Co-occurring difficulties may be seen in aspects of language, motor co-ordination, mental calculation, concentration and personal organisation, but these are not, by themselves, markers of dyslexia. - A good indication of the severity and persistence of dyslexic difficulties can be gained by examining how the individual responds or has responded to well-founded intervention. Pupils in KS1 are monitored against the indicators of dyslexia every term. Pupils mature and progress at different speeds and by the time they are entering KS2 most will have reached the expected levels in reading, spelling, writing and maths. For those who are showing signs of dyslexia further action will be taken. What will the school do if they think my child is dyslexic? If the usual class support is not progressing a child's learning then the school will consider other additional support. This could be by having extra learning as part of a group or individually, using additional resources to help a child learn (access to phonic cards, spelling lists), repeating sessions more than once, help the child to discover their learning preferences and use these when learning new things. If whole class strategies that usually support all pupils, is not helping a pupil learn, we will assess their phonic knowledge, verbal memory and processing memory in more depth and plan ways to best support their learning. This may result in setting additional or different targets for the child that are written in a Personalised Learning Plan. (PLP) The PLP is reviewed every term and new targets and/or strategies may be planned according to the pupil’s progress. Parents are updated on their child's progress three times per year at parents' evenings and also three reports. Why can't assessments be carried out until after the age of 7? Many children under 7 make common literacy mistakes (whilst they are still learning) which are very similar to those children who display dyslexic tendencies. Therefore in depth assessments are not carried out unless the child is 7 plus. However that does not mean we wait until the child is 7 to support their learning. We run a number of additional learning programmes to support children with their phonics and reading in key stage 1 e.g. phonic groups, additional small group literacy support, etc. Although school can carry out a series of tests and assessments we cannot give an official diagnosis of dyslexia. This can only be done by an Educational Psychologist. How will you support my child emotionally? Dyslexic children have to work much harder than their peers to produce an equivalent amount of work. They can get very tired and become disheartened. We understand that poor motivation and self-esteem have a serious effect on a pupil’s ability to learn. We give recognition for effort as well as achievement and give opportunities for pupils to demonstrate their strengths. The fear of failure is removed by the setting of achievable targets and classrooms are a calm environment where pupils can feel confident to make mistakes and ask for help. Do whatever you can to make reading an enjoyable activity. Reassure your child; just because they have difficulties with learning it does not mean that they are stupid. Give lots of praise. Raise confidence and try to encourage a 'can do' attitude. Let them know that it's okay to make mistakes; mistakes are a natural part of learning. Trying again and again is important. Prompt your child as necessary. Don't let them struggle on needlessly. Encourage talents and interests. Remind your child what they are good at. Having literacy difficulties or being dyslexic does not rule out being successful. Remember being Dyslexic means you have a learning difference. Pupils can help themselves by finding different ways to help them to learn. All information can be obtained in printed form on request.